In memory of Norman Curson, the Victoria Police Blue Ribbon Foundation donated $85,000 for Bendigo Hospital to purchase a specialised heart monitoring machine. The echocardiogram, often referred to as a cardiac echo or simply an echo, is a sonogram of the heart. Echocardiography uses standard two-dimensional, three-dimensional, and Doppler ultrasound to create images of the heart. Echocardiography has become routinely used in the diagnosis, management, and follow-up of patients with any suspected or known heart diseases. It is one of the most widely used diagnostic tests in cardiology. It can provide a wealth of helpful information, including the size and shape of the heart (internal chamber size quantification), pumping capacity, and the location and extent of any tissue damage. Things are usually serious when a patient is admitted to an Intensive Care Unit. The anxiety and stress often extends to family and friends who understandably want to be close by. The Victoria Police Blue Ribbon Foundation recognises that there needs to be facilities for families, as well as patients and installed a special room in the ICU/CCU Department at Bendigo Hospital with this in mind. The room provides a quiet and private place for families and loved ones who have patients in Intensive or Critical care at the hospital. It is fitted with comfortable furnishings, TV, DVD, Video and has its own kitchen area so that people can have refreshments and meals. It also acts as a counseling room when medical staff need to discuss a patient’s condition and prognosis in privacy. The ICU/CCU Room at Bendigo Hospital was dedicated as a Police Memorial in memory of Senior Constable Charles Norman Curson. 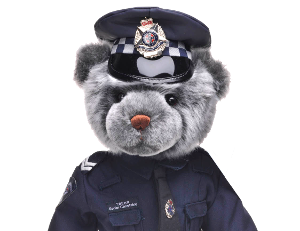 At about 3.20pm of Tuesday 8th January 1974, Senior Constable Curson of the Melbourne District Traffic & Patrol Division was standing on the steps of Flinder’s Street railway station when a man walked up behind him, produced a knife and cut the policeman’s throat. Curson was rushed to the Prince Henry’s Hospital but died two hours later. The death of Senior Constable Curson in this manner perhaps underlines how suddenly and randomly police members may be faced with life threatening situations.